Here's an idea for mounting the Wii on your wall. I went to Home Depot and bought $12 of plumbing materials and used a can of tan spray paint I had at home. The result is a setup that won't attract lots of attention and will fix the wiimote in place. I won't glue the parts together, by the way, so things can be repositioned later. 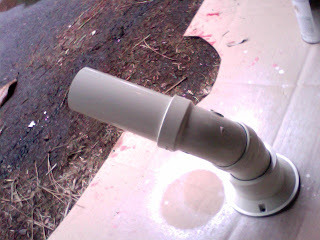 The parts I bought are all 2" black pipe (the kind they use for waste-water in households). I put part numbers for Home Depot in case that's helpful.